A regular breeding resident and migrant. The Tennessee Warbler was uncommon during the Minnesota Breeding Bird Atlas (MNBBA). Found in a narrow band across Canada from southern Newfoundland and Labrador to British Columbia, the southern Northwest Territories, and southern Yukon Territory, and in the northern portions of the upper Midwest and in the northern New England states (Figure 1). The highest densities have been recorded in eastern Quebec and from northern Manitoba to northern British Columbia. Long-distance migrant that spends the winter in the Caribbean, Central America, and northwestern South America. Arthropods that are gleaned from foliage, especially spruce budworm caterpillars. Cup nest on the ground, usually hidden near the base of a shrub or hidden in Sphagnum moss. Breeding distribution and relative abundance of the Tennessee Warbler in North America based on the federal Breeding Bird Survey from 2011 to 2015 (Sauer et al. 2017). Historically described by Roberts (1932) as “undoubtedly breeding in the northern part of Minnesota, as it has been found in limited numbers in the nesting-season from Lake Superior west to eastern Marshall County and south to Cass Lake.” Roberts (1932) reported “no nests or very young” had been found in Minnesota during his tenure, but he includes many locations where the Tennessee Warbler was observed or heard singing during the breeding season. These locations included the counties of Cass, Cook, Lake, Marshall, and St. Louis. Roberts dismissed a nest found by Hatch (1892) at Lake Minnetonka in June 1881 as an identification error. More than 40 years later, Green and Janssen (1975) described a similar distribution for the Tennessee Warbler as a breeding resident “in northeastern and north central regions as far south as Duluth and Itasca State Park.” They emphasized the species was scarce through most of this area except “along the Canadian border in Cook County, northern Lake County, and northern St. Louis County.” They only reported confirmed nesting from Lake County but inferred nesting from Clearwater, Cook, and St. Louis Counties. A few years later, Eckert (1983) described the Tennessee Warbler as rare and local during the breeding season. Janssen (1987) modified the breeding distribution of Green and Janssen to exclude northern Aitkin County, most of Itasca County, and both Cass and Marshall Counties. He suggested the breeding range extended into northern Hubbard County. Janssen did not report any confirmed nests, but Hertzel and Janssen (1998) added St. Louis County to the list of counties where nesting has been confirmed since 1970. During extensive county surveys, the Minnesota Biological Survey recorded 163 breeding season locations of the Tennessee Warbler (Minnesota Department of Natural Resources 2017). These locations included many in Cook County and northern St. Louis County and a few in western Lake County. Additional observations included one location in southern Clearwater County and two in southern Beltrami County. The breeding distributions of these locations likely coincided with where spruce budworm (Choristoneura fumiferana) outbreaks occurred at the time of the breeding counts. The MNBBA included a total of 298 breeding season records. Nesting was confirmed in St. Louis and Lake Counties, probable nesting in Cook and Roseau Counties, and possible nesting in Aitkin, Beltrami, Cass, Kittson, Koochiching, Itasca, Lake of the Woods, and Marshall Counties (Figure 2). A total of 3.8% (179/4,735) of all blocks sampled and 3.9% (90/2,337) of priority blocks included breeding evidence (Figure 3; Table 1). The spatial pattern of the Tennessee Warbler’s breeding distribution from the MNBBA was similar to that described by Roberts in 1932 and by Green and Janssen in 1975. The bulk of the records were located as previously described, largely in the northeastern counties of Cook, Lake, and St. Louis. The probability map based on MNBBA point counts predicted highest densities of the Tennessee Warbler in northeastern and northern Minnesota (Figure 4). This was especially true for Cook, Koochiching, Lake, and St. Louis Counties. Rimmer and McFarland (2012) reviewed the North American distribution of the Tennessee Warbler and concluded that no significant changes had been documented for this species since 1966, when the federal Breeding Bird Survey (BBS) was initiated. They underscored that short-term fluctuations in local distributions were dictated by insect outbreaks, especially by the spruce budworm. The Tennessee Warbler is a rare species in Wisconsin, with only one confirmed nesting record found in 1977 on Oak Island in the Apostle Islands (Cutright et al. 2006). No nests were found during Wisconsin’s breeding bird alas of 1995–2000. In Michigan this species is rare, and no differences in its abundance were found between its first atlas (1983–1988) and its second atlas (2002–2008) (Chartier et al. 2013). Breeding distribution of the Tennessee Warbler in Minnesota based on the Breeding Bird Atlas (2009 – 2013). Summary statistics of observations by breeding status category for the Tennessee Warbler in Minnesota based on all blocks (each 5 km x 5 km) surveyed during the Breeding Bird Atlas (2009-2013). Summary statistics for the Tennessee Warbler observations by breeding status category for all blocks and priority blocks (each 5 km x 5 km) surveyed during the Minnesota Breeding Bird Atlas (2009-2013). Predicted breeding distribution (pairs per 40 hectares) of the Tennessee Warbler in Minnesota based on habitat, landscape context, and climate data gathered during the Minnesota Breeding Bird Atlas (2009-2013) using the General Linear Modeling method with an adjustment for detectability. The Tennessee Warbler uses a wide variety of habitats throughout its range during the breeding season. Rimmer and McFarland (2012) summarized its habitat use as varying from early successional forests to mature forests in Ontario, all wooded habitats in southwestern James Bay, boreal spruce-fir forests in Maine, and boreal mixed-wood forests in Saskatchewan. Roberts (1932) reported “that it breeds sparingly in the spruce and arbor vitae swamps of the northern part of the state.” He also pointed out during a trip to the Lake Vermillion region in June 1894 that it was “fairly well-represented though not as common as the Nashville.” More than 120 years later, this statement is definitely still true in Minnesota. Breeding bird habitat data for the Tennessee Warbler are scarce in Minnesota. In the National Forest Bird (NFB) Monitoring program, Niemi et al. (2016) found that the Tennessee Warbler uses a variety of forested habitats, including regenerating conifers, aspen-birch, and lowland conifer forests. In Michigan, Brewer et al. (1991) described its primary breeding habitat as conifer bogs in parklike settings of black spruce, usually mixed with tamarack, white cedar, and sometimes birch, poplar, and alder. In intensive counts in the Agassiz Lowlands Ecological Subsection, Bednar et al. (2016) rarely observed the species in the extensive forested bogs during the breeding season but frequently observed late migrants that did not persist over the course of the breeding season. Habitat data gathered at MNBBA point counts indicated the species was most commonly found in upland coniferous forests, bogs, and lowland coniferous forests (Figure 5). In one of the few landscape-oriented studies in the region, Grinde (2015) analyzed population dynamics using a 20-year record of breeding bird monitoring data in Minnesota’s two national forests, the Chippewa and the Superior. She found that the Tennessee Warbler responded positively to smaller patch sizes and was more persistent in a landscape matrix with small “fine-grained” forest patches. Because the species’ breeding population in Minnesota appears to be so closely related to the spruce budworm cycle, its habitat use closely aligns with the patchiness of these outbreaks. Typical breeding habitat of the Tennessee Warbler in Minnesota (© Gerald J. Niemi). Habitat profile for the Tennessee Warbler based on habitats within 200 m of point counts where the species was present during the Minnesota Breeding Bird Atlas (2009-2013). Partners in Flight (Rosenberg et al. 2016) estimates this species’ current North American population at 95 million breeding adults. Previously, the Partners in Flight Science Committee (2013) had estimated a Minnesota breeding population of 40,000 adults. The MNBBA, however, estimated a much larger population of almost 204,000 with a 95% confidence interval of 147,000 – 324,000 breeding adults. This much larger estimate in Minnesota can be explained in two ways: 1) spruce budworm populations were relatively high in northeastern Minnesota during the MNBBA count period from 2009 to 2013, and 2) the MNBBA had substantially better coverage of the extreme northern portions of Minnesota. Roadless regions in northern Minnesota were not covered by the federal Breeding Bird Survey (BBS), which was used by Partners in Flight to estimate population sizes. Environment Canada (2014) estimated a breeding population of more than 50 million adults in Canada. Populations of the Tennessee Warbler are well known to fluctuate widely during spruce budworm outbreaks. For instance, quantitative population estimates of breeding populations in Ontario during a spruce budworm cycle ranged from 75 to 610 pairs per km2 in mature forest (Kendeigh 1947). The BBS population trends for Minnesota were unreliable because of too few observations (e.g., only a mean of 1.2 detections per route; Sauer et al. 2017). Trends for the Boreal Hardwood Transition region indicated a significant negative trend of 3.67% per year from 1966 to 2015 (Figure 6). In contrast, the trends for Canada and survey-wide were stable but tended toward a decline from 1966 to 2000. Trends from 2000 to 2015 have leveled off (Figure 7). Overall Partners in Flight (Rosenberg et al. 2016) estimated a 15% decline in the North American population of the Tennessee Warbler. 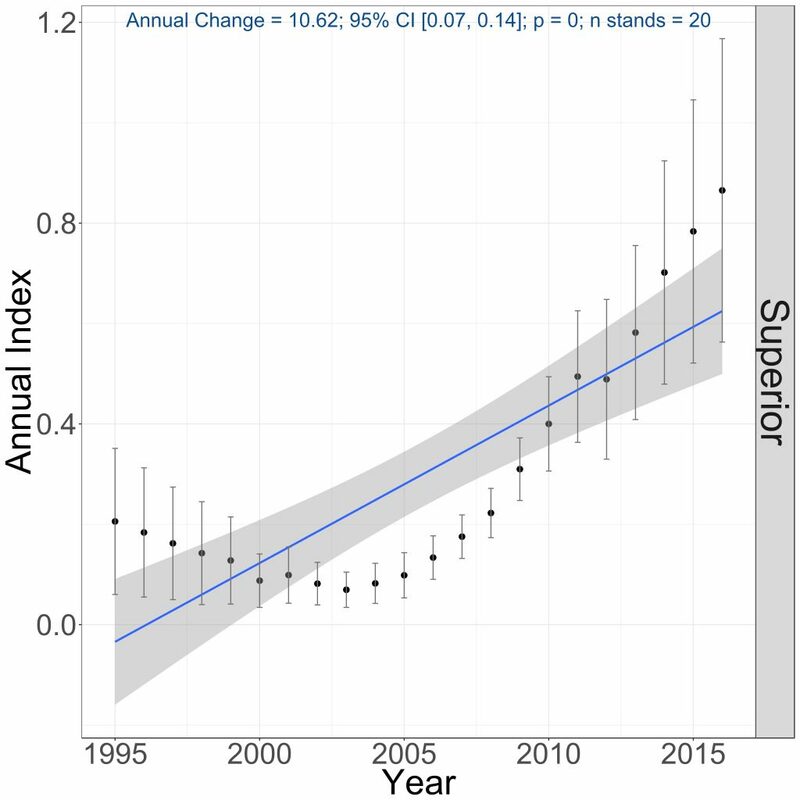 The breeding population trend in the Superior National Forest during the NFB monitoring program had an overall significantly increasing population from 1995-2016 of 10.6% per year (Figure 8). Tennessee Warblers declined from 1995 to 2003 but since that time they have been increasing because of the presence of spruce budworm in northeastern Minnesota. Tennessee Warblers were not abundant enough in the Chippewa National Forest to estimate a trend. Mean population estimates in the Chippewa and Superior National Forests ranged from 0.03 to 0.32 pairs per 40 ha, respectively (Niemi et al. 2016). These estimates, which cover a wide range of habitats within each of these national forests, provide additional evidence for the greater presence of the Tennessee Warbler in northeastern Minnesota. 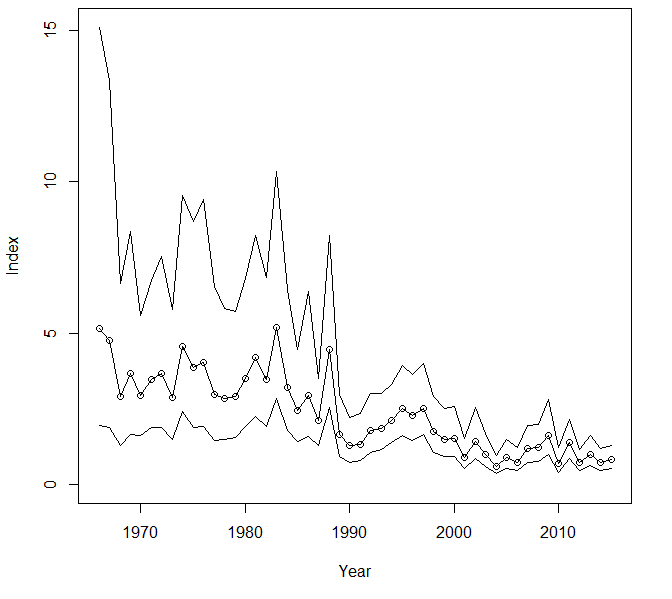 Breeding population trend for the Tennessee Warbler in the Boreal Hardwood Transition region for 1966–2015 based on the federal Breeding Bird Survey (Sauer et al. 2017). 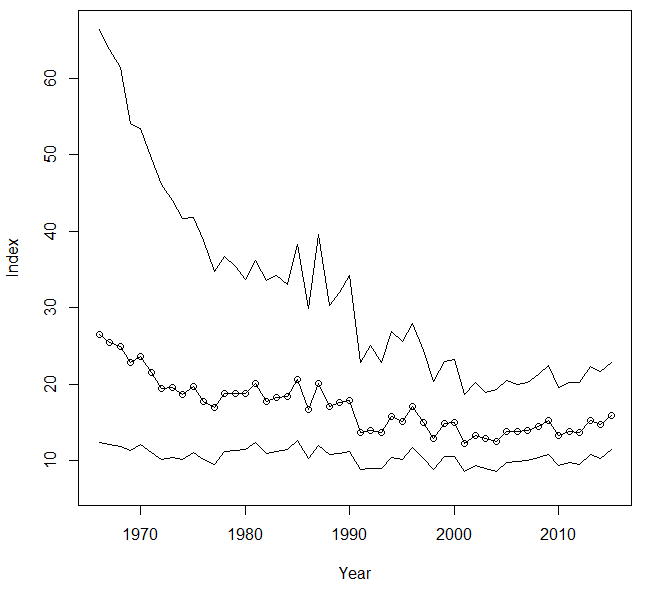 Breeding population trend survey-wide in North America for 1966–2015 based on the federal Breeding Bird Survey (Sauer et al. 2017). Breeding population trends of the Tennessee Warbler in the Superior National Forests, 1995–2016 (Bednar et al. 2016). Overall populations of the Tennessee Warbler are healthy, but they fluctuate widely with available food supplies. The species is clearly highly beneficial for forest management. For instance, a Tennessee Warbler can consume 65 to 100 caterpillars, or 6 g, per day. Using these data, Niemi (2010) calculated that this level of consumption for a 12-gram bird is equivalent to a 150-pound human eating 75 pounds of hamburger in a day! More important are the benefits derived by enhanced growth of trees from photosynthetic leaves or needles that were not consumed by the caterpillars removed by Tennessee Warblers and other insectivorous birds. Holling (1978) provided modeling evidence that spruce budworm cycles could be extended by the insectivory of forest bird populations, especially if their populations did not decline. The Tennessee Warbler has a low overall conservation score of 7/20 (Rosenberg et al. 2016), primarily because of its large population and wide distribution across North America. The species has no officially designated conservation concerns in jurisdictions where it is found nesting; however, Canada has designated it as a priority or stewardship species in one or more of its Bird Conservation Region Strategies (Environment Canada 2014). Rimmer and McFarland (2012) reviewed studies conducted on the effects of pesticide applications to control Lepidopterans such as the spruce budworm. Many of these studies have shown some negative effects on the populations of insectivorous birds like the Tennessee Warbler, but the results have not been overwhelmingly negative. For instance, reduced nest attentiveness was significant in studies of tebufenozide-treated areas compared with controls (Rimmer and McFarland 2012). Reductions in food supplies with insect spraying programs may have an important effect on the population of this warbler. In other conservation concerns, the Tennessee Warbler has frequently been found at communication towers, where it is reported as either the fourth or fifth most frequently killed species at towers in the following regions: Central Hardwoods, Eastern Tallgrass Prairie, Prairie Hardwood and Boreal Hardwood Transition, and the Appalachian Mountains/Piedmont (Longcore 2013). However, degradation of habitat does not appear to be a problem in highly forested areas because the species is found in a wide variety of habitat types. But some concerns exist around wintering grounds and the bird’s use of shade coffee plantations. Greenberg et al. (1997) raised concerns with reductions in floristic diversity, pesticide applications, or conversions of shade plantations to more intensively managed coffee plantations. In its review of climate sensitivity for 588 species of North American birds, Langham et al. (2015) and the National Audubon Society (2015) identified the Tennessee Warbler as “climate threatened.” Based on its climate models, the society estimated a 58% loss of the species’ current summer range by 2080 and projected a strong shift northward. It also suggested that more suitable wintering habitat may become available along the Gulf Coast. Whether breeding habitat to the north of its current range will be suitable for this species is an open question. Eckert, Kim R. 1983. “Proceedings of the Minnesota Ornithological Records Committee.” Loon 55: 41–43. Greenberg, Russell, Peter Bichier, Andrea Cruz Angon, and Robert Reitsma. 1997. “Bird Populations in Shade and Sun Coffee Plantations in Central Guatemala.” Conservation Biology 11: 448–459. Holling, Crawford S. 1978. Adaptive Environmental Assessment and Management. New York: John Wiley & Sons. Niemi, Gerald J. 2010. “Opportunistic Tennessee Warblers.” Minnesota Conservation Volunteer 73(March/April): 40–47.